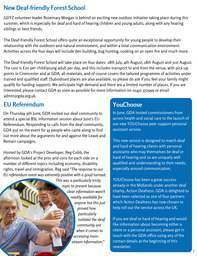 Welcome Welcome to another issue of GDA’s Hear for You newsletter. 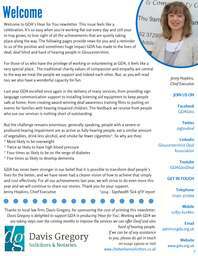 It gives me great pleasure to write to you all as the new CEO of GDA. I have had a fantastic introduction to the work of this amazing charity and have been welcomed warmly by staff, volunteers and the people we support. 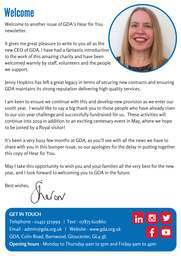 Jenny Hopkins has left a great legacy in terms of securing new contracts and ensuring GDA maintains its strong reputation delivering high quality services. I am keen to ensure we continue with this and develop new provision as we enter our 100th year. I would like to say a big thank you to those people who have already risen to our 100 year challenge and successfully fundraised for us. These activities will continue into 2019 in addition to an exciting centenary event in May, where we hope to be joined by a Royal visitor! 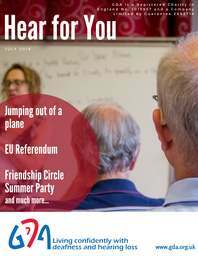 It&apos;s been a very busy few months at GDA, as you&apos;ll see with all the news we have to share with you in this bumper issue, so our apologies for the delay in putting together this copy of Hear for You. May I take this opportunity to wish you and your families all the very best for the new year, and I look forward to welcoming you to GDA in the future. Best wishes, GET IN TOUCH Telephone - 01452 372999 | Text - 07875 610860 Email - admin@gda.org.uk | Website - www.gda.org.uk GDA, Colin Road, Barnwood, Gloucester, GL4 3JL Opening hours - Monday to Thursday 9am to 5pm and Friday 9am to 4pm GDA news A message from Jenny Hopkins Some of you may already know that after ten very happy and fulfilling years at GDA, I have decided to move on in November. Those of you who know me will understand what a tough decision this has been, but I will be going with the knowledge that I have achieved everything I could ever have hoped to do with this wonderful organisation, and I believe GDA has now reached point where I can leave the best possible legacy and let the journey continue under Sharon, as the new CEO, with all the fresh energy and vision it deserves. Thank you to everyone for the huge support you have given me over the years. Welcoming new staff to the team As GDA continues to grow with the service it provides to deaf and hard of hearing people, so too does the staff team. We are delighted to have welcomed two new members of staff to the team this year; Sarah Cook joined as a new Bookings Coordinator in April, working alongside Mary Hailes to arrange British Sign Language (BSL interpreter bookings, and Steph Blackburn, who has come on board as Equipment Services Assistant, supporting the Hard of Hearing team. You can book an appointment to see Steph at GDA on a Monday and Wednesday, when she can provide advice on the wide-range of listening aid equipment we have available to buy, or on a Tuesday and Friday for hearing-aid maintenance. 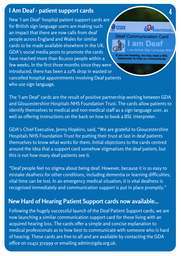 I Am Hard of Hearing cards Following on from the huge success of GDA&apos;s Deaf Patient Support cards in August 2017, GDA has now launched a &apos;I am hard of hearing&apos; card for those with an acquired hearing loss. The cards offer clear and simple prompts to help a person follow a conversation. The cards are free and are available upon request from the GDA office; in writing to GDA, Colin Road, Barnwood, Gloucester, GL4 3JL, by telephone on 01452 372999 or text 07875 610860. GDPR - safeguarding you and protecting your information You will have seen that new data protection laws came in to force in May 2018. Protecting your information is extremely important to us, and in order for GDA to be GDPR compliant, we have put additional security measures in place, as well as revising our Privacy Notice, which you can read on our website, www.gda.org.uk, or watch a BSL version on our Facebook page. If you have any questions about GDA and GDPR, please contact our Data Protection Officer on 01452 372999 or email dpo@gda.org.uk. Please vote for GDA to win £10,000 GDA has been shortlisted to win a whooping £10,000, but we need YOUR help. Local business Lansdown Insurance is hosting &apos;Lansdown Giving&apos;, an initiative that will see them award cash prizes from £150 to £10,000 to the ten charities with the most votes. 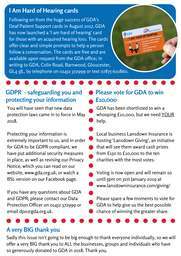 Voting is now open and will remain so until 5pm on 31st January 2019 at www.lansdowninsurance.com/giving/ Please spare a few moments to vote for GDA to help give us the best possible chance of winning the greater share. 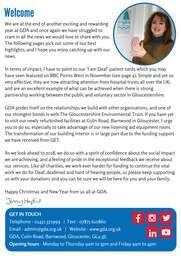 A very BIG thank you Sadly this issue isn&apos;t going to be big enough to thank everyone individually, so we will offer a very BIG thank you to ALL the businesses, groups and individuals who have so generously donated to GDA in 2018. Thank you. Young people trip to London On Thursday 16th August, a group of volunteers an young people and their parents got up bright and early and headed to London for a very special day trip in the capital. 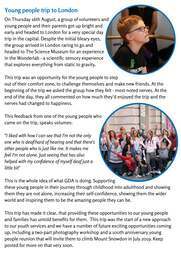 Despite the initial bleary eyes, the group arrived in London raring to go and headed to The Science Museum for an experience in the Wonderlab - a scientific sensory experience that explores everything from static to gravity. This trip was an opportunity for the young people to step out of their comfort zone, to challenge themselves and make new friends. At the beginning of the trip we asked the group how they felt - most noted nerves. At the end of the day, they all commented on how much they&apos;d enjoyed the trip and the nerves had changed to happiness. This feedback from one of the young people who came on the trip, speaks volumes: "I liked with how I can see that I&apos;m not the only one who is deaf/hard of hearing and that there&apos;s other people who is just like me. It makes me feel I&apos;m not alone. 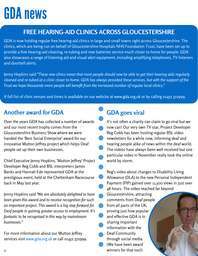 Just seeing that has also helped with my confidence of myself deaf just a little bit" This is the whole idea of what GDA is doing. Supporting these young people in their journey through childhood into adulthood and showing them they are not alone, increasing their self-confidence, showing them the wider world and inspiring them to be the amazing people they can be. This trip has made it clear, that providing these opportunities to our young people and families has untold benefits for them. This trip was the start of a new approach to our youth services and we have a number of future exciting opportunities coming up, including a two-part photography workshop and a 100th anniversary young people reunion that will invite them to climb Mount Snowdon in July 2019. Keep posted for more on that very soon. Cirencester Deaf Children&apos;s Club (CDCC) have enjoyed a year full of fun activities and outings in 2019. In May, the young members and their families gathered at Roves Farm, near Swindon, for a fun-packed day on the farm. Members got a chance to enjoy a rather bumpy tractor ride to meet a very Hungry Caterpillar, as well having a go at feeding the lambs and racing the energetic sheep and goats! It was a particularly poignant session in July, a number of CDCC members graduated from the club. They will continue to be supported by our Family Support Worker and will be invited to get involved in a number of upcoming exciting opportunities. It&apos;s been an absolute joy to see the children grow into young people and we wish them all the very best for the future. And what other way is there to end the year, other then a CDCC Christmas party. Once again the members were treated to a visit from Mr Christmas himself, who very generously took time out of his busy schedule to hand out gifts to the children. 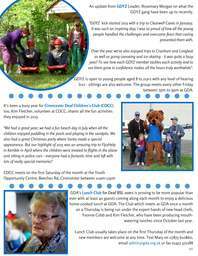 None of these activities would be possible without the continued dedication of the CDC volunteers, so a big thank you to them for all hard work and creativity in continuing to come up with fun and engaging activities for the club to enjoy. Gloucester Deaf Club (GDC) have enjoyed several highlights this year including hosting the UK Deaf Sports Whist Drive Pairs in April, in which two GDC members came runners up. 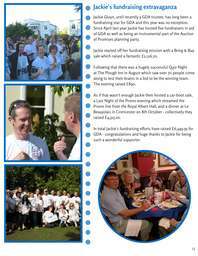 In August the group then enjoyed a seaside trip to Torquay where they also paid the local Deaf Club a visit, and in October they came together for a fun quiz night. 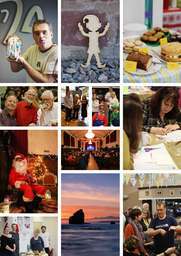 Our popular Friendship Circle social activities returned in 2018 with the annual summer and Christmas gatherings. Over 140 guests joined us for the two occasions, to enjoy a delicious home-cooked meal, courtesy of Yumma Food. Once again our friends at Ecclesiastical Insurance joined us to help look after our guests. We cannot thank them enough for all their hard work and we look forward to welcomin them to GDA once more in June for the first of ou 2019 Friendship Circle gatherings. 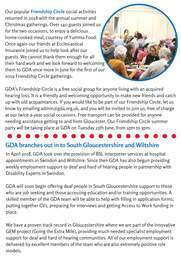 GDA&apos;s Friendship Circle is a free social group for anyone living with an acquired hearing loss. It is a friendly and welcoming opportunity to make new friends and catch up with old acquaintances. If you would like to be part of our Friendship Circle, let us know by emailing admin@gda.org.uk, and you will be invited to join us, free of charge at our twice-a-year social occasions. Free transport can be provided for anyone needing assistance getting to and from Gloucester. Our Friendship Circle summer party will be taking place at GDA on Tuesday 25th June, from 1pm to 3pm. GDA branches out in to South Gloucestershire and Wiltshire In April 2018, GDA took over the provision of BSL interpreter services at hospital appointments in Swindon and Wiltshire. 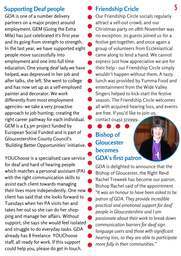 Since then GDA has also begun providing weekly employment support to deaf and hard of hearing people in partnership with Disability Experts in Swindon. 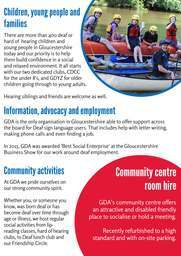 GDA will soon begin offering deaf people in South Gloucestershire support to those who are job seeking and those accessing education and/or training opportunities. A skilled member of the GDA team will be able to help with filling in application forms, putting together CVs, preparing for interviews and getting Access to Work funding in place. 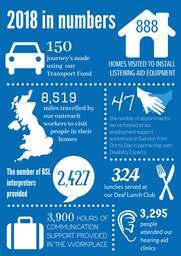 We have a proven track record in Gloucestershire where we are part of the innovative GEM project (Going the Extra Mile), providing much needed specialist employment support for deaf and hard of hearing communities. All of our employment support is delivered by excellent members of the team who are also extremely positive role models. 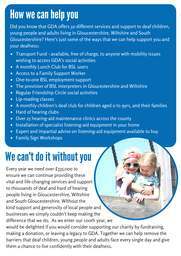 How we can help you Did you know that GDA offers 32-different services and support to deaf children, young people and adults living in Gloucestershire, Wiltshire and South Gloucestershire? 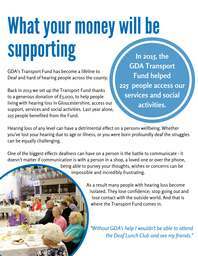 Here&apos;s just some of the ways that we can help support you and your deafness: Transport Fund - available, free of charge, to anyone with mobility issues wishing to access GDA&apos;s social activities A monthly Lunch Club for BSL users Access to a Family Support Worker One-to-one BSL employment support The provision of BSL interpreters in Gloucestershire and Wiltshire Regular Friendship Circle social activities Lip-reading classes A monthly children&apos;s deaf club for children aged 0 to 9yrs, and their families Hard of hearing clubs Over 25 hearing-aid maintenance clinics across the county Installation of specialist listening-aid equipment in your home Expert and impartial advise on listening-aid equipment available to buy Family Sign Workshops We can&apos;t do it without you Every year we need over £535,0oo to ensure we can continue providing these vital and life-changing services and support to thousands of deaf and hard of hearing people living in Gloucestershire, Wiltshire and South Gloucestershire. Without the kind support and generosity of local people a businesses we simply couldn&apos;t keep making t difference that we do. 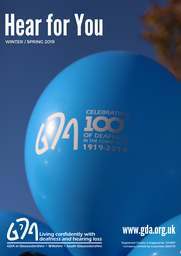 As we enter our 100th year, we would be delighted if you would consider supporting our charity by fundraising, making a donation, or leaving a legacy to GDA. Together we can help remove the barriers that deaf children, young people and adults face every single day and give them a chance to live confidently with their deafness. 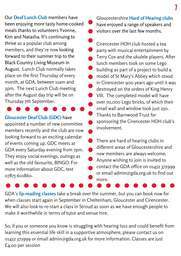 In aid of GDA Back in the summer a Gloucester based National Citizen Service (NCS) group contacted us to let us know they had chosen GDA as their charity for their planned fundraising. The group of 15 to 17yr olds organised a summer fete as part of their NCS programme, and raised a wonderful £740 for GDA. 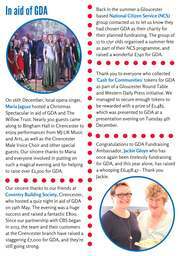 Thank you to everyone who collected &apos;Cash for Communities&apos; tokens for GDA On 16th December, local opera singer, Maria Jagusz hosted a Christmas Spectacular in aid of GDA and The Willow Trust. Nearly 300 guests came along to Bingham Hall in Cirencester to enjoy performances from MJ-UK Music and Arts, as well as the Cirencester Male Voice Choir and other special guests. Our sincere thanks to Maria and everyone involved in putting on such a magical evening and for helping to raise over £1,300 for GDA. Our sincere thanks to our friends at Coventry Building Society, Cirencester, who hosted a quiz night in aid of GDA on 19th May. The evening was a huge success and raised a fantastic £800. Since our partnership with CBS began in 2015, the team and their customers at the Cirencester branch have raised a staggering £7,000 for GDA, and they&apos;re still going strong. as part of a Gloucester Round Table and Western Daily Press initiative. We managed to secure enough tokens to be rewarded with a prize of £1,485, which was presented to GDA at a presentation evening on Tuesday 4th December. Congratulations to GDA Fundraising Ambassador, Jackie Gloyn who has once again been tirelessly fundraising for GDA, and this year alone, has raised a whooping £6,458.47 - Thank you Jackie. Welcome We are at the end of another exciting and rewarding year at GDA and once again we have struggled to cram in all the news we would love to share with you. 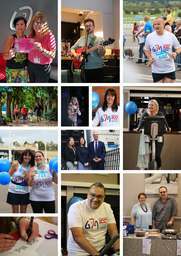 The following pages pick out some of our best highlights, and I hope you enjoy catching up with our news. In terms of impact, I have to point to our ‘I am Deaf’ patient cards which you may have seen featured on BBC Points West in November (see page 4). Simple and yet so very effective, they are now attracting attention from hospital trusts all over the UK, and are an excellent example of what can be achieved when there is strong partnership working between the public and voluntary sector in Gloucestershire. GDA prides itself on the relationships we build with other organisations, and one of our strongest bonds is with The Gloucestershire Environmental Trust. 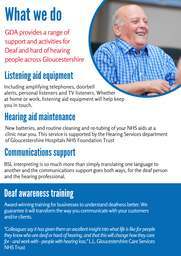 If you have yet to visit our newly refurbished facilities at Colin Road, Barnwood in Gloucester, I urge you to do so, especially to take advantage of our new listening aid equipment room. The transformation of our building interior is in large part due to the funding support we have received from GET. As we look ahead to 2018, we do so with a spirit of confidence about the social impact we are achieving, and a feeling of pride in the exceptional feedback we receive about our services. Like all charities, we work ever harder for funding to continue the vital work we do for Deaf, deafened and hard of hearing people, so please keep supporting us with your donations and you can be sure we will be here for you and your family. Happy Christmas and New Year from us all at GDA. GET IN TOUCH Telephone - 01452 372999 | Text - 07875 610860 Email - admin@gda.org.uk | Website - www.gda.org.uk GDA, Colin Road, Barnwood, Gloucester, GL4 3JL Opening hours - Monday to Thursday 9am to 5pm and Friday 9am to 4pm GDA news 3 New! Listening Aid Showroom GDA has undergone a bit of a transformation recently and the results are, even if we do say so ourselves, amazing. 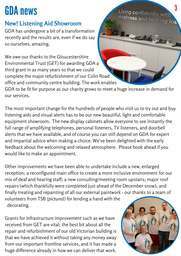 We owe our thanks to the Gloucestershire Environmental Trust (GET) for awarding GDA a third grant in as many years so that we could complete the major refurbishment of our Colin Road office and community centre building. The work enables GDA to be fit for purpose as our charity grows to meet a huge increase in demand for our services. The most important change for the hundreds of people who visit us to try out and buy listening aids and visual alerts has to be our new beautiful, light and comfortable equipment showroom. The new display cabinets allow everyone to see instantly the full range of amplifying telephones, personal listeners, TV listeners, and doorbell alerts that we have available, and of course you can still depend on GDA for expert and impartial advice when making a choice. We&apos;ve been delighted with the early feedback about the welcoming and relaxed atmosphere. Please book ahead if you would like to make an appointment. Other improvements we have been able to undertake include a new, enlarged reception; a reconfigured main office to create a more inclusive environment for our mix of deaf and hearing staff; a new consulting/meeting room upstairs; major roof repairs (which thankfully were completed just ahead of the December snow); and finally treating and repainting of all our external paintwork - our thanks to a team of volunteers from TSB (pictured) for lending a hand with the decorating. Grants for infrastructure improvement such as we have received from GET are vital; the best bit about all the repair and refurbishment of our old Victorian building is that we have achieved it without taking any money away from our important frontline services, and it has made a huge difference already in how we can deliver that work. 6 Introducing GDA&apos;s new Youth Participation Leader We are delighted to have welcomed a new Youth Participation Leader to the team. Gilson Sly (pictured) joined GDA in August and is working with our GDYZ and CDCC groups, as well as Teachers of the Deaf to ensure local deaf children and their families get the right support. Gilson is himself deaf since birth and is equally fluent in sign and speech which makes him ideal to work with both hearing and deaf families. Gilson has experience of leading youth groups and his obvious connection with members of our youth group, GDYZ, who attended the second stage interview will make him an extremely positive role model. It&apos;s been 8 years since GDA had a Youth Leader on its staff, so the appointment of Gilson is an exciting one for the charity and the future of its children and youth people services. The Silent Child film comes to GDA On Friday 27th October we were very honoured to welcome the award-winning film, The Silent Child to GDA for a special screening. The film stars Maisie (pictured right), who attends GDA&apos;s CDCC and Forest School clubs. 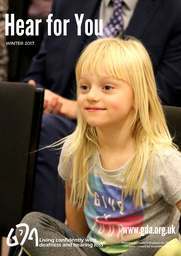 In the film, Libby is a fouryear-old profoundly deaf girl, who is born into a midd class family and lives in a world of silence until a caring social worker teaches her the gift of communication. The film&apos;s collection of awards from the international film festival circuit, means it is now up for a BAFTA and OSCAR nomination. Fellow actor and director, Rachel Shenton (pictured right) was also at the screening and shared her motivation behind making the film with the audience of local teachers, Advisory Teachers and Councillors and urged them all to champion deaf inclusion, especially in schools. 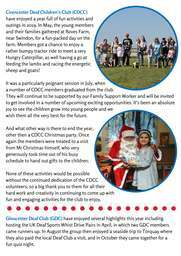 Club updates 7 The highlight of the CDCC (Cirencester Deaf Children&apos;s Club) calendar has to be Gifford Circus, and this year was no exception. The circus once again wowed the CDCC crowd. 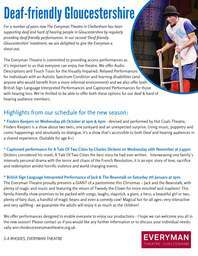 As well as enjoying high-flying acrobats and dancing horses, the CDCC gang has got stuck in with a &apos;sausage sizzle&apos; themed meeting in October and an art morning i November. New members are welcome t come along to the sessions, which norma place on the first Saturday of the month. Its just £2.50 per family and hearing children and best friends are also invited to join in the fun. 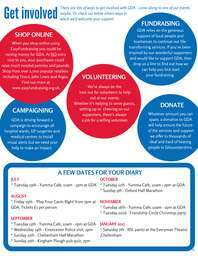 For more information contact Gilson on gilson.sly@gda.org.uk. 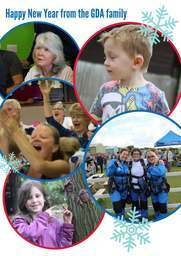 After a summer of fun at the GDA at Greenways Forest School, the popular outdoor sessions will return for a festive get-together on Monday 18th December, this time at brand new premises in Hartpury. Forest School offers a schooling experience like no other, allowing the children and young people to explore and learn on their own terms in a safe environment. What makes the GDA at Greenways Forest School so special is its total communication environment - whether a child is a BSL user or hearing, they will have the opportunity to take part in all the activities, from playing hide&apos;n&apos;seek and bug hunting, to story-telling and cooking marshmallows on the open fire. Future Forest School dates for 2018 will be announced very soon, so do keep an eye out for those coming via our Facebook page and website, www.gda.org.uk. 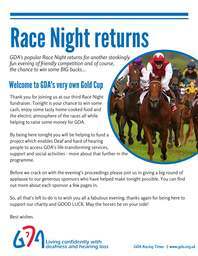 For more information please contact contact Gilson on gilson.sly@gda.org.uk or call 01452 372999. 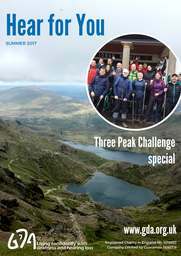 Welcome GDA&apos;s highlight of the past six months is without question the magnificent Three Peak Challenge. I will leave you to whizz to page 9 to read all about it, but I can’t resist sharing the following social media message that was posted by a stranger who has no connection with our charity but who just happened to be at the base of Snowdon when our group finally finished perhaps the most gruelling 24 hours of their lives... “I watched this group whilst they celebrated being at the bottom of Snowdon with their Prosecco…I have never seen such a lovely bunch of happy people. It was amazing to watch them sign to each other and just be full of pure happiness. I was left feeling so uplifted after watching them celebrate and thank each other! 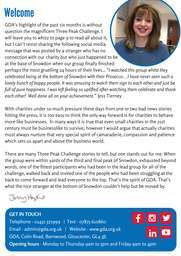 Well done all on your achievement.” Jess Tierney With charities under so much pressure these days from one or two bad news stories hitting the press, it is too easy to think the only way forward is for charities to behave more like businesses. In many ways it is true that even small charities in the 21st century must be businesslike to survive; however I would argue that actually charities must always nurture that very special spirit of camaraderie, compassion and patience which sets us apart and above the business world. 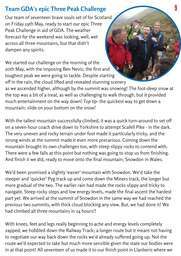 There are many Three Peak Challenge stories to tell, but one stands out for me. When the group were within yards of the third and final peak of Snowdon, exhausted beyond words, one of the fittest participants who had been in the lead group for all of the challenge, walked back and invited one of the people who had been struggling at the back to come forward and lead everyone to the top. That’s the spirit of GDA. That’s what the nice stranger at the bottom of Snowdon couldn’t help but be moved by. GET IN TOUCH Telephone - 01452 372999 | Text - 07875 610860 Email - admin@gda.org.uk | Website - www.gda.org.uk GDA, Colin Road, Barnwood, Gloucester, GL4 3JL Opening hours - Monday to Thursday 9am to 5pm and Friday 9am to 4pm Charlotte&apos;s story 3 Hi, please introduce yourself. 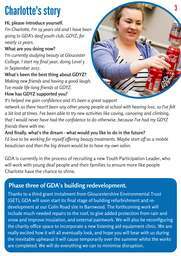 I&apos;m Charlotte, I&apos;m 19 years old and I have been going to GDA&apos;s deaf youth club, GDYZ, for nearly 12 years. What are you doing now? I&apos;m currently studying beauty at Gloucester College. 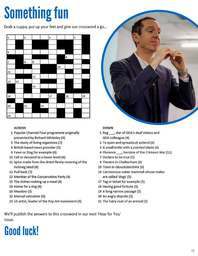 I start my final year, doing Level 3 in September 2017. What&apos;s been the best thing about GDYZ? Making new friends and having a good laugh. I&apos;ve made life-long friends at GDYZ. How has GDYZ supported you? It&apos;s helped me gain confidence and it&apos;s been a great support network as there hasn&apos;t been any other young people at school with hearing loss, so I&apos;ve felt a bit lost at times. I&apos;ve been able to try new activities like caving, canoeing and climbing, that I would never have had the confidence to do otherwise, because I&apos;ve had my GDYZ friends there with me. And finally, what&apos;s the dream - what would you like to do in the future? I&apos;d love to be working for myself offering beauty treatments. Maybe start off as a mobile beautician and then the big dream would be to have my own salon. GDA is currently in the process of recruiting a new Youth Participation Leader, who will work with young deaf people and their families to ensure more like people Charlotte have the chance to shine. Phase three of GDA&apos;s building redevelopment. Thanks to a third grant instalment from Gloucestershire Environmental Trust (GET), GDA will soon start its final stage of building refurbishment and redevelopment at our Colin Road site in Barnwood. The forthcoming work will include much needed repairs to the roof, to give added protection from rain and snow and improve insulation, and external paintwork. We will also be reconfiguring the charity office space to incorporate a new listening aid equipment clinic. We are really excited how it will all eventually look, and hope you will bear with us during the inevitable upheaval it will cause temporarily over the summer whilst the works are completed. We will do everything we can to minimise disruption. 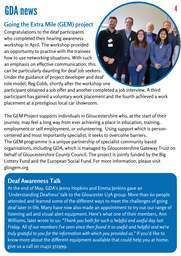 GDA news Going the Extra Mile (GEM) project 4 Congratulations to the deaf participants who completed their hearing awareness workshop in April. The workshop provided an opportunity to practise with the trainees how to use networking situations. With such an emphasis on effective communication, this can be particularly daunting for deaf job seeke Under the guidance of project developer and d role model, Reg Cobb, shortly after the worksh participant obtained a job offer and another completed a job interview. A third participant has gained a voluntary work placement and the fourth achieved a work placement at a prestigious local car showroom. The GEM Project supports individuals in Gloucestershire who, at the start of their journey, may feel a long way from ever achieving a place in education, training, employment or self employment, or volunteering. Using support which is personcentered and most importantly specialist, it seeks to overcome barriers. 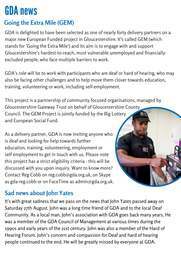 The GEM programme is a unique partnership of specialist community based organisations, including GDA, which is managed by Gloucestershire Gateway Trust on behalf of Gloucestershire County Council. The project is jointly funded by the Big Lottery Fund and the European Social Fund. 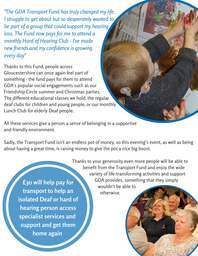 For more information, please visit glosgem.org Deaf Awareness Talk At the end of May, GDA&apos;s Jenny Hopkins and Emma Jenkins gave an &apos;Understanding Deafness&apos; talk to the Gloucester U3A group. More than 60 people attended and learned some of the different ways to meet the challenges of going deaf later in life. Many have now also made an appointment to try out our range of listening aid and visual alert equipment. Here&apos;s what one of their members, Ann Williams, later wrote to us: "Thank you both for such a helpful and useful day last Friday. All of our members I&apos;ve seen since then found it so useful and helpful and we&apos;re truly grateful to you for the information with which you provided us." If you&apos;d like to know more about the different equipment available that could help you at home, give us a call on 01452 372999. YouChoose Hearing aid clinics YouChoose is an innovative peersupport service which enables anyone living with significant deafness to receive support from a personal assistant who is also deaf. It has been working highly successfully in the Midlands and GDA is now helping to bring it to Gloucestershire and South Gloucestershire. Whether you are a sign language user, or someone who has become deaf over time and speaks but doesn’t hear, the only criteria is that you feel you would benefit from the regular companionship of someone who understands you perfectly. Our deaf personal assistants are all warm, kind people who are selected on the basis that they have more confidence to manage everyday challenges better and can help you do the same. That may be to help you meet new friends, get fit or simply enjoy shopping trips together. For information about how YouChoose works, please contact the GDA office. 5 GDA has recently added two new venues to its list of more than 20 clinics around Gloucestershire where you can have your aids cleaned and re-tubed: Cheltenham East Community Fire and Rescue Station, Keynesham Road, GL53 7PX on the 3rd Tuesday of every month between 10am and 12pm. Please note that for September only, this clinic will take place on the 3rd Friday (15th September) between 10am and 12pm. Fresh Ground Cafe, 26 Westward Road, Stroud, GL5 4JQ on the 4th Thursday of every month between 10am and 12pm. To find your local clinic or to book onto any of our hearing-aid clinics, please contact the GDA office on 01452 372999 or text 07875 610860. Friendship Circle Summer Party On Tuesday 27th June, over 70 guests came to GDA for the Friendship Circle summer party. This is a free event for anyone with an acquired hearing loss; it&apos;s a chance to meet new friends and catch up with old ones, while enjoying a delicious lunch, which this year was provided by Yumma Food. Our thanks to Jacky, Becky, Lorraine, Louise and Jane from our corporate partner, Ecclesiastical, who volunteered their time to support the event and ensure everyone was well looked after. The Friendship Circle will return with its Christmas party on Tuesday 28th November - hope to see you there. were greeted by supporters who&apos;d made the journey up to welcome us back. The bubbles were popped open and our celebrations began. We&apos;d completed our challenge! It was tough; the toughest thing any of us had ever done. It pushed us to our limited and at some points, it broke us, but we always, always smiled. 10 Our team was a mix of all ages; men and women, all abilities, and of deaf and hearing people. We proved that whatever you feel your limitations are, when you are with team mates who will share, support and laugh through the challenge with you, you can do anything you set your mind to. I am so proud of what we achieved; not just over the weekend but over the last seven months preparing for this challenge. 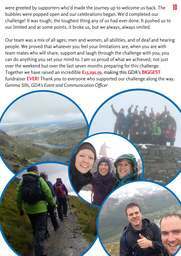 Together we have raised an incredible £13,291.59, making this GDA&apos;s BIGGEST fundraiser EVER! Thank you to everyone who supported our challenge along the way. 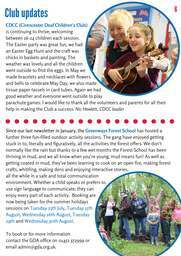 Gemma Sills, GDA&apos;s Event and Communication Officer 11 DATES FOR YOUR DIARY JULY * Tuesday 25th - Forest School, 10am to 2pm. * Saturday 29th - Colorvibe 5k, Bristol. Could you join our team? AUGUST * Tuesday 15th, Wednesday 16th, Tuesday 29th and Wednesday 30th - Forest School, 10am to 2pm. OCTOBER * Sunday 1st - Cheltenham Half Marathon. Could you join our team? NOVEMBER * Tuesday 28th - Friendship Circle Christmas party at GDA, 1pm to 3pm. 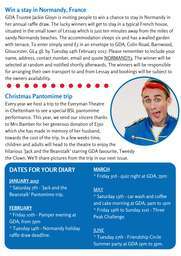 DECEMBER * Saturday 16th - Pantomime at Everyman Theatre, 2pm. Listening aid equipment to help you at home We have a wide range of listening aid equipment that can help you at home. If you&apos;re struggling to hear the phone, doorbell or television there is a piece of equipment that could help. 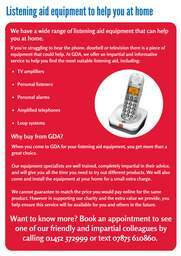 At GDA, we offer an impartial and informative service to help you find the most suitable listening aid, including: TV amplifiers Personal listeners Personal alarms Amplified telephones Loop systems Why buy from GDA? When you come to GDA for your listening aid equipment, you get more than a great choice. Our equipment specialists are well trained, completely impartial in their advice, and will give you all the time you need to try out different products. We will also come and install the equipment at your home for a small extra charge. We cannot guarantee to match the price you would pay online for the same product. However in supporting our charity and the extra value we provide, you help ensure this service will be available for you and others in the future. Want to know more? Book an appointment to see one of our friendly and impartial colleagues by calling 01452 372999 or text 07875 610860. 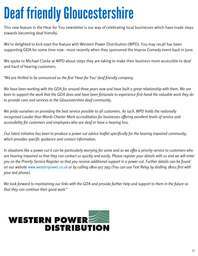 Hear for You JANUARY 2017 www.gda.org. 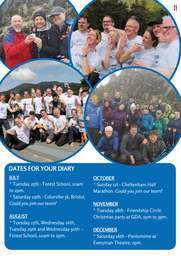 Welcome Dear GDA friends and supporters The start of the calendar year is often a favourite time at GDA. 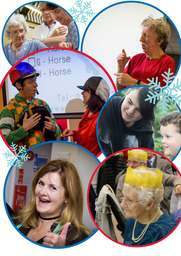 Memories are still fresh from our Christmas parties held for our Friendship Circle members and also Cirencester Deaf Children’s Club (CDCC). 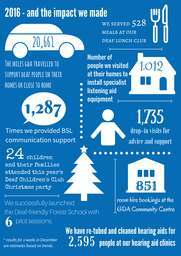 It’s a natural time as well to reflect on the last twelve months and think how much has been achieved for deaf adults and children in Gloucestershire, which is due not just to the dedication of our staff and volunteers, but also to the wonderful support we receive from donors and from fundraisers. 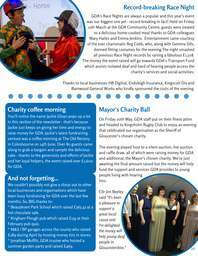 In many ways 2016 proved an outstanding year, and some of the reasons why are featured in this latest edition of our newsletter. We have launched a deaf friendly Forest School for children and young people; we have organised workshops, visits t police stations and created sign language films around different aspects of safety; w have visited more people at home than ever before to install listening aid equipmen we have set up regular hearing aid clinics around the county for new batteries, cleaning and re-tubing; we have launched an e-learning ‘Understand Deafness’ training programme; and we have achieved 100% fulfilment on every one of our fiv public sector contracts. As we look ahead to 2017, may I take this opportunity to thank everyone who suppo GDA in one way or another. We simply could not achieve half of what we do withou you. Wishing you all the best for the year ahead. 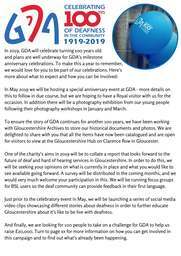 GET IN TOUCH Telephone - 01452 372999 Text - 07875 610860 Email - admin@gda.org.uk Website - www.gda.org.uk Colin Road, Barnwood, Gloucester, GL4 3JL Opening hours - Monday to Thursday 9am to 5pm. Friday 9am to 4pm to we ent; ve orts out Sally s story Hi, please introduce yourself I am Sally Gillespie. I am mum to Callum who is 3 and a half. Callum was born hearing but at nine months developed bacterial menigitis. Thankfully he survived but he was left with hearing loss in both ears and as a result he now wears hearing aids. How has GDA helped you and your family? 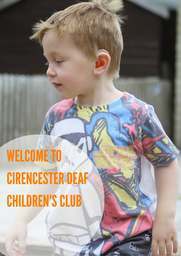 We&apos;ve been attending Cirencester Deaf Children&apos;s Club (CDCC) for two years and we go every month. It’s been fantastic for me to speak to other parents and for Callum to engage with other children. The realisation that deaf children can do most things other children can do - such as go to the pantomime and enjoy music - has been very comforting. We didn’t know anything about deafness so it&apos;s been a massive learning cur and CDCC has been a fantastic support mechanism. What has been the biggest change you’ve seen in Callum as a result of the support you’ve had? His confidence has grown tremendously, and you can see him learn how to focus better and join in. 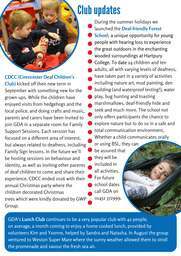 I&apos;d recommend CDCC and GDA to anyone with a deaf child. It is scary; I remember being petrified – I&apos;d never been around deaf children before, but I&apos;ve learnt no to be scared. Talking to other parents has been hugely valuable. And finally, tell us a little more about you – what’s your ideal day out in Gloucestershire? We love going to Pitville Park in Cheltenham and getting ice-cream and hot chocolates with marshmallows. We&apos;d probably finish with a roast dinner and a trip to the pool swimming - a perfect weekend treat. 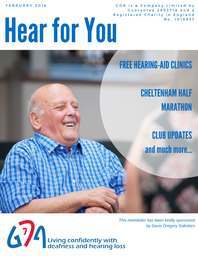 New hearing-aid clinics announced GDA has launched a number of new free hearing-aid clinics across Gloucestershire. New clinics are now also taking place in Coleford, Stroud and Cam. The clinics are an opportunity for NHS hearing-aid wearers to get hearing-aids retubed, cleaned and get new batteries. Our technicians are also available to offer impartial advise on specialist listening aid equipment that can help you hear at home. Find a clinic near you at www.gda.org.uk or call 01452 372999. Booking is essential for most clinics. 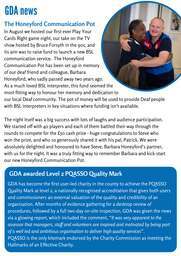 GDA news The Honeyford Communication Pot In August we hosted our first ever Play Your Cards Right game night, our take on the TV show hosted by Bruce Forsyth in the 90s, and its aim was to raise fund to launch a new BSL communication service. The Honeyford Communication Pot has been set up in memory of our deaf friend and colleague, Barbara Honeyford, who sadly passed away two years ago As a much loved BSL interpreter, this fund seeme most fitting way to honour her memory and dedication to our local Deaf community. The pot of money will be used to provide Deaf people with BSL interpreters in key situations where funding isn&apos;t available. The night itself was a big success with lots of laughs and audience participation. We started off with 40 players and each of them battled their way through the rounds to compete for the £50 cash prize - huge congratulations to Steve who won the prize, and who so generously shared it with his pal, Patrick. We were absolutely delighted and honoured to have Steve, Barbara Honeyford&apos;s partner, with us for the night. It was a truly fitting way to remember Barbara and kick-start our new Honeyford Communication Pot. GDA awarded Level 2 PQASSO Quality Mark GDA has become the first user-led charity in the county to achieve the PQASSO Quality Mark at level 2, a nationally recognised accreditation that gives both users and commissioners an external valuation of the quality and credibility of an organisation. After months of evidence gathering for a desktop review of procedures, followed by a full two-day on-site inspection, GDA was given the new via a glowing report, which included the comment, “It was very apparent to the assessor that managers, staff and volunteers are inspired and motivated by being part of a well led and ambitious organisation to deliver high quality services”. PQASSO is the only kitemark endorsed by the Charity Commission as meeting the Hallmarks of an Effective Charity. rs ws rt he GDA news Police Commissioner&apos;s Fund GDA is coming towards the end of a two- year safety project funded by the Police Commissioner’s Fund. It has proved both valuable and impactful. Recent activities have included a very interesting visit from the Forest of Dean Hard of Hearing Club to Coleford Police Station, where members were treated to an afternoon talk around safety issues; a police talk also at the Cirencester Hard of Hearing Club; and a BSL film on ‘What action to take during an emergency’, which to date has attracted more than 11,000 views on GDA’s Facebook Community Page. 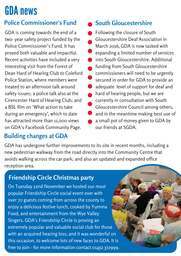 South Gloucestershire Following the closure of South Gloucestershire Deaf Association in March 2016, GDA is now tasked with expanding a limited number of servic into South Gloucestershire. Additiona funding from South Gloucestershire commissioners will need to be urgent secured in order for GDA to provide a adequate level of support for deaf an hard of hearing people, but we are currently in consultation with South Gloucestershire Council among other and in the meantime making best use a small pot of money given to GDA by our friends at SGDA. Building changes at GDA GDA has undergone further improvements to its site in recent months, including a new pedestrian walkway from the road directly into the Community Centre that avoids walking across the car park; and also an updated and expanded office reception area. Friendship Circle Christmas party On Tuesday 22nd November we hosted our most popular Friendship Circle social event ever with over 70 guests coming from across the county to enjoy a delicious festive lunch, cooked by Yumma Food, and entertainment from the Wye Valley Singers. GDA&apos;s Friendship Circle is proving an extremely popular and valuable social club for those with an acquired hearing loss, and it was wonderful on this occasion, to welcome lots of new faces to GDA. It is free to join - for more information contact 01452 372999. GDA news Going the Extra Mile (GEM) GDA is delighted to have been selected as one of nearly forty delivery partners on a major new European Funded project in Gloucestershire. 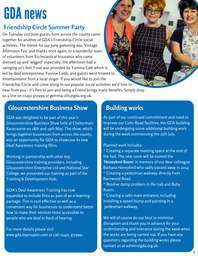 It&apos;s called GEM (which stands for &apos;Going the Extra Mile&apos;) and its aim is to engage with and support Gloucestershire&apos;s hardest-to-reach, most vulnerable unemployed and financiallyexcluded people, who face multiple barriers to work. GDA&apos;s role will be to work with participants who are deaf or hard of hearing, who m also be facing other challenges and to help move them closer towards education, training, volunteering or work, including self-employment. This project is a partnership of community focused organisations, managed by Gloucestershire Gateway Trust on behalf of Gloucestershire County Council. The GEM Project is jointly funded by the Big Lo and European Social Fund. 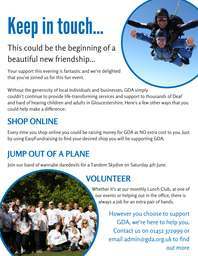 As a delivery partner, GDA is now inviting anyone who is deaf and looking for help towards further education, training, volunteering, employment or self employment to get in touch with us. Please note this project has a strict eligibility criteria - this will be discussed with you upon inquiry. Want to know more? 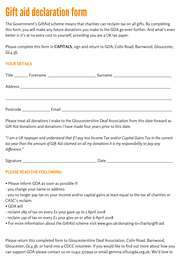 Contact Reg Cobb on reg.cobb@gda.org.uk, on Skype as gda-reg.cobb or on FaceTime as admin@gda.org.uk. Sad news about John Yates It&apos;s with great sadness that we pass on the news that John Yates passed away on Saturday 27th August. 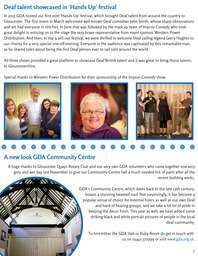 John was a long time friend of GDA and to the local Deaf Community. As a local man, John’s association with GDA goes back many years. He was a member of the GDA Council of Management at various times during the 1990s and early years of the 21st century. John was also a member of the Hard of Hearing Forum. John’s concern and compassion for Deaf and hard of hearing people continued to the end. He will be greatly missed by everyone at GDA. 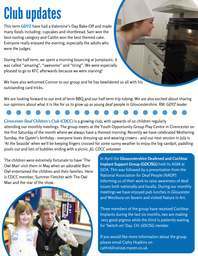 a may He Club updates CDCC (Cirencester Deaf Children&apos;s Club) kicked off their new term in September with something new for the grown-ups. While the children have enjoyed visits from hedgehogs and the local police, and doing crafts and music, parents and carers have been invited to join GDA in a separate room for Family Support Sessions. Each session has focused on a different area of interest, but always related to deafness, including Family Sign lessons. In the future we’ll be hosting sessions on behaviour and identity, as well as inviting other parents of deaf children to come and share their experience. CDCC ended 2016 with their annual Christmas party where the children decorated Christmas trees which were kindly donated by GWP Group. During the summer holidays we launched the Deaf-friendly Forest School; a unique opportunity for youn people with hearing loss to experience the great outdoors in the enchanting wooded surroundings at Hartpury College. To date 24 children and ten adults, all with varying levels of deafne have taken part in a variety of activitie including nature art, mud painting, de building (and waterproof testing! ), wa play, bug hunting and toasting marshmallows, deaf-friendly hide and seek and much more. The school not only offers participants the chance to explore nature but to do so in a safe a total communication environment, Whether a child communicates orally or using BSL, t be assured tha they will be included in all activities. 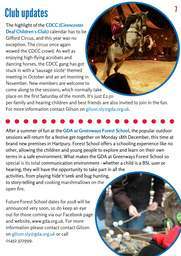 For future school dates call GDA on 01452 372999. GDA&apos;s Lunch Club continues to be a very popular club with 42 people, on average, a month coming to enjoy a home cooked lunch, provided by volunteers Kim and Yvonne, helped by Sandra and Natasha. In August the group ventured to Weston Super Mare where the sunny weather allowed them to stroll the promenade and savour the fresh sea air. 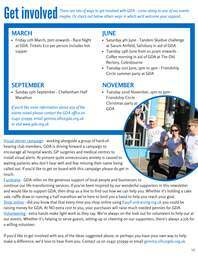 In aid of GDA It&apos;s been a busy season of half marathons at GDA recently with supporters taking on the Cheltenham, Oxford and Stroud Half Marathons during September and October. Gemma Buckley, Richard Sills and Jim Thomson took on the 13.1 mile courses and between them they have raised over £1,400 for GDA. Huge thanks and congratulations to each of our runners on their fantastic achievements. We are very excited to have been announced as the charity partner of TSB&apos;s Gloucestershire Head Office in Barnwood. 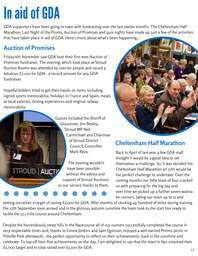 Over the coming year, TSB partners will be carrying out a whole host of fundraising activities including a Christmas market, quiz nights and sweepstakes. Debbie Waterland at TSB Barnwood, said: “GDA is a local cause that’s close to people hearts here in Barnwood and we are delighted to welcome them as our new Local Charity Partner. We’re busy planning lots of fundraising activities for the coming months and can’t wait to build our partnership with GDA and support the vital work that they do for our local community." 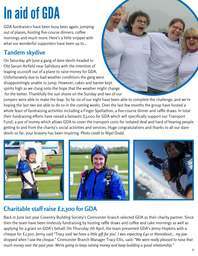 The partners at TSB will be hoping to raise £3,500 for GDA during the year&apos;s partnership. On 22nd October, GDA and a team players from Gloucester Deaf Footb Club headed to the New Lawn Stadium, home of Forest Green Rovers (FGR), for the book launch o &apos;The Rise of Forest Green Rovers; The Road to Wembley&apos; which has been written by GDA Chair Chris Gardne in aid of GDA. 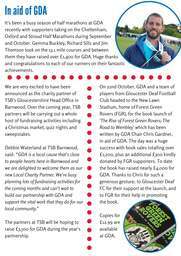 The day was a huge success with book sales totalling ov £1,200, plus an additional £300 kin donated by FGR supporters. 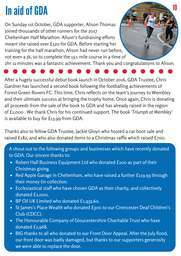 To dat the book has raised nearly £4,000 f GDA. Thanks to Chris for such a generous gesture; to Gloucester De FC for their support at the launch, a to FGR for their help in promoting the book. Copies for £12.99 are available at GDA. 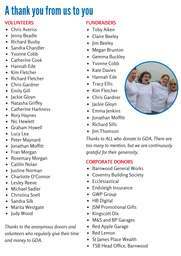 m of tball of e er, ver ndly ate for eaf and A shout out to the following groups and businesses who have recently donated to GDA. 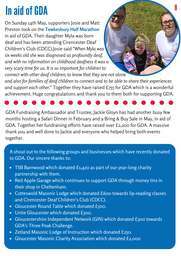 Our sincere thanks to: Jim Beeley who, as Sheriff of Gloucester 2015/2016, raised £3,154.60 for GDA. St James&apos; Place Wealth who donated £300 towards the work of Cirencester Dea Children&apos;s Club (CDCC). Newent Community School for raising £108 at a student and teacher collection An anonymous donor who kindly gave £3,500. The money has been requested to support our new YOUChoose service and children&apos;s activities. 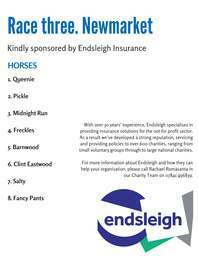 Endsleigh Insurance and Zurich Community Trust who donated £100 following a staff vote. Red Apple Garage who have been collecting for GDA and to date have raised over £658 for GDA. Zumba with Jane who raised £220 following a raffle draw during which GDA wa chosen as the winning charity. Brockhampton Village Hall who raised £300 at an open day. 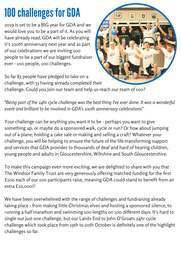 Team GDA&apos;s next fundraising challenge We&apos;ve done triathlons, we run half marathons and we&apos;ve jumped out of planes. So, what next? Why, the Three Peak Challenge of course. 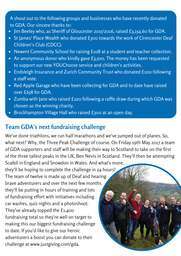 On Friday 19th May 2017 a tea of GDA supporters and staff will be making their way to Scotland to take on the firs of the three tallest peaks in the UK, Ben Nevis in Scotland. They&apos;ll then be attempti Scafell in England and Snowdon in Wales. And what&apos;s more, they&apos;ll be hoping to complete the challenge in 24 hours! The team of twelve is made up of Deaf and hearing brave adventurers and over the next few months they&apos;ll be putting in hours of training and lots of fundraising effort with initiatives including car washes, quiz nights and a photoshoot. They&apos;ve already topped the £1,400 fundraising total so they&apos;re well on target to making this our biggest fundraising challenge to date. 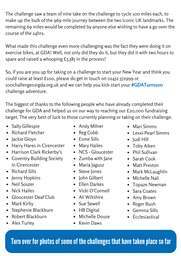 If you&apos;d like to give our heroic adventurers a boost you can donate to their challenge at www.justgiving.com/gda. y y, GDA Trustee Jackie Gloyn is inviting people to win a chance to stay in Normandy in her annual raffle draw. The lucky winners will get to stay in a typical French house, situated in the small town of Lessay which is just ten minutes away from the miles o sandy Normandy beaches. The accommodation sleeps six and has a walled garden with terrace. 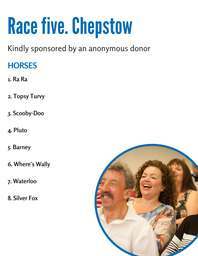 To enter simply send £5 in an envelope to GDA, Colin Road, Barnwood Gloucester, GL4 3JL by Tuesday 14th February 2017. Please remember to include yo name, address, contact number, email and quote NORMANDY5. The winner will be selected at random and notified shortly afterwards. 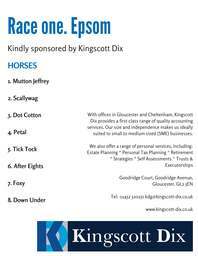 The winners will be responsible for arranging their own transport to and from Lessay and bookings will be subject t the owners availability. Christmas Pantomime trip Every year we host a trip to the Everyman Theatre in Cheltenham to see a special BSL pantomime performance. This year, we send our sincere thanks to Mrs Bamber for her generous donation of £550 which she has made in memory of her husband, towards the cost of the trip. In a few weeks time, children and adults will head to the theatre to enjoy the hilarious &apos;Jack and the Beanstalk&apos; starring GDA favourite, Tweedy the Clown. We&apos;ll share pictures from the trip in our next issue. DATES FOR YOUR DIARY JANUARY 2017 * Saturday 7th - &apos;Jack and the Beanstalk&apos; Pantomime trip. FEBRUARY * Friday 10th - Pamper evening at GDA, from 7pm * Tuesday 14th - Normandy holiday raffle draw deadline. 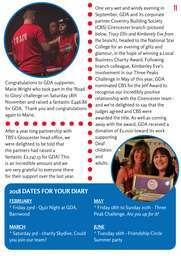 MARCH * Friday 3rd - quiz night at GDA, 7pm MAY * Saturday 13th - car wash and coffee and cake morning at GDA, 9am to 1pm * Friday 19th to Sunday 21st - Three Peak Challenge. 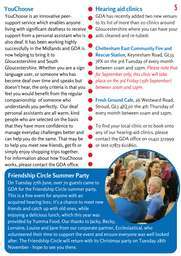 JUNE * Tuesday 27th - Friendship Circle Summer party at GDA 1pm to 3pm. n , of n od, our be le to m Listening aid equipment to help you at home Introducing the Signolux Visual Alert System - £53.94 including P&P Signolux (pronounced ‘Sig – no – lux’) An exciting new addition to our range of equipment, the all-singing, all-dancing Signolux visual signal system. This versatile and compact system, with a range of up to 200 metres can be used as an alert for the doorbell, smoke alarm and telephone. It&apos;s portable and wireless so you can take it anywhere in the home, including the garden The flashing light and picture on the receiver will alert you if something is happening even you&apos;re wearing headphones or you&apos;re on the loop. 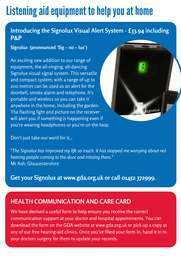 Don&apos;t just take our word for it... "The Signolux has improved my life so much. It has stopped me worrying about not hearing people coming to the door and missing them." Mr Ash, Gloucestershire HEALTH COMMUNICATION AND CARE CARD Get your Signolux at www.gda.org.uk or call 01452 372999. We have devised a useful form to help ensure you receive the correct communication support at your doctor and hospital appointments. 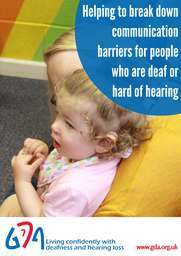 You can download the form on the GDA website at www.gda.org.uk or pick up a copy at any of our free hearing-aid clinics. Once you&apos;ve filled your form in, hand it in to your doctors surgery for them to update your records. Welcome Dear GDA friends and supporters, Some days in the GDA office it feels as though there is barely time even to catch our breath. First we say hi to David and Sam B, who have already been busy for an hour setting up the community centre and making everywhere shipshape. Then it&apos;s grab a quick coffee or tea, whilst Mary and Sue are checking messages and taking the first of what could be fifty calls in a single day; Gem gets busy on social media and nurturing our ever growing number of supporters; by 9.15am Emma is sprinting off to do her morning visits to install listening aid equipment; Sam Q is rushing to her first hearing-aid re-tubing clinic; Reg is taking a Skype call or enjoying the first of his several snacks of the day (how DOES he stay so slim, given how much he eats?! ); James and Hannah are busy too on BSL interpreting assignments; and I am invariably getting ready for my first meeting of the day or settling down to write the next grant application. The kind of workload we manage each week can be colossal. And yet there are very special moments too when you realise what makes it all worthwhile. I can think of two recent ones. The first was a beautiful thank you letter we received from someone after she had been rushed into hospital with suspected meningitis and we had been able to provide a BSL interpreter in double-quick time to be by her side as she underwent not one but four lumbar puncture tests, which thankfully revealed she had a less serious form of the disease. 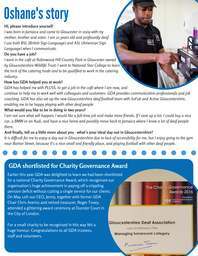 The second was when GDA was selected as one of three finalists for the first ever Charity Governance Awards and I and two GDA Board members enjoyed a trip to London for what proved to be a very prestigious event - more about that further on in the newsletter. 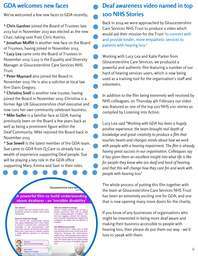 Enjoy reading this latest newsletter from GDA, and thank you for continuing to support the important work we do. Best wishes, Jenny Jenny Hopkins, Chief Executive JOIN US ON Facebook GDAGlos Twitter @glosdeaf Linkedin Gloucestershire Deaf Association Youtube GDAGlosDeaf GET IN TOUCH Telephone 01452 372999 Mobile GDA is open Monday to Thursday, 9am to 5pm and Friday 9am to 4pm Colin Road, Barnwood, Gloucester, Gloucestershire, GL4 3JL 07875 610860 Email admin@gda.org.uk Website www.gda.org.uk 2 Oshane&apos;s story Hi, please introduce yourself I was born in Jamaica and came to Gloucester in 2009 with my mother, brother and sister. I am 22 years old and profoundly deaf. I use both BSL (British Sign Language) and ASL (American Sign Language) when I communicate. Do you have a job? I work in the café at Robinwood Hill Country Park in Gloucester owne by Gloucestershire Wildlife Trust. I went to National Star College to le the trick of the catering trade and to be qualified to work in the cateri industry. 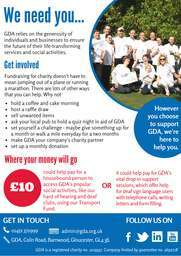 How has GDA helped you at work? GDA has helped me with PLUSS, to get a job in the café where I am n continue to help me to work well with colleagues and customers. GDA provides communication professionals and job coaching. GDA has also set up the new Gloucestershire deaf football team with SoFab and Active Gloucestershire, enabling me to be happy playing with other deaf people What would you like to be in doing in two years? I am not sure what will happen; I would like a full-time job and make more friends. If I save up a lot, I could buy a nice car, a BMW or an Audi, and have a nice home and possibly move back to Jamaica where I know a lot of deaf people there. And finally, tell us a little more about you - what’s your ideal day out in Gloucestershire? It is difficult for me to enjoy a day out in Gloucestershire due to lack of accessibility for me, but I enjoy going to the gym near Barton Street, because it’s a nice small and friendly place, and playing football with other deaf people. GDA shortlisted for Charity Governance Award Earlier this year GDA was delighted to learn we had been sh for a national Charity Governance Award, which recognised organisation&apos;s huge achievement in paying off a crippling pension deficit without cutting a single service for our client On May 12th our CEO, Jenny, together with former GDA Chair Chris Averiss and retired treasurer, Roger Tovey, attended a glittering award ceremony at Dunster Court in the City of London. For a small charity to be recognised in this way felt a huge honour. Congratulations to all GDA trustees, staff and volunteers. Listening aid equipment to help you at home GDA&apos;s Listening-aid Equipment Shop offers a wide range of specialist listening-aid equipment which can help you around the home. From vibrating alarms to TV amplifiers and amplified telephones, we can support you to regain independence and security in the place you should feel safest, your home. ARTONE 3 MAX Just slip this handy little gadget on each day and you will be amazed at how well it helps you hear better during a mobile phone conversation or listening to music. Jenny, our CEO and Chris r, GDA&apos;s Chair, are h huge fans and say it ally is a transforming piece of equipment. Why not pop along to the GDA office and try it for yourself. You need to be a hearing aid wearer and your ds needs to have a T tch. £107.87 inc P&P HAPPY CUSTOMER It is always lovely to receive positive feedback from our service users, and these lovely comments from a gentleman we helped recently with our listening-aid equipment service is testament to the high level support anyone can expect to receive from GDA. "I just want to say what a great service I have received from your team. Not only did I receive good advice, I also had a home visit in no time at all. A letter was even sent to me in the post when you could not get me over the phone. During the home visit I was provided with an Echo MiniTech+. I am delighted with the product that already has very clearly made such a difference for me. I can&apos;t wait to use it in the car when my disabled son is with me. It will enable me to hear him again when I&apos;m driving. A GOD SEND. Your team member was so polite and professional, the same for when we met her at my GP surgery recently. You are all a credit to the service and people you support. Top marks. Thank you so much, credit where it&apos;s due." SM. MITCHELDEAN. Contact us today on 01452 372999 or admin@gda.org.uk to find out how we can help. COST £107.96 inc P&P AMPLICOMMS TV LISTENER This popular device is ideal for anyone who struggles to hear the TV, but at the same time doesn&apos;t want to make others uncomfortable by making the TV volume too loud. Working with T-switch on your hearing aid, the listener creates your own personal hearing loop, and users tell us how much it helps them get better clarity as well as sound. A big plus, it&apos;s so easy to use. The Amplicomms TV Listener is a top selling product at GDA. 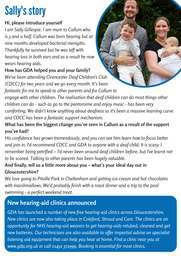 Dear Families, Welcome to Cirencester Deaf Children’s Club (CDCC)! 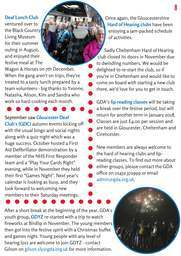 CDCC plays a very important role in the work of Gloucestershire Deaf Association (GDA), which is the only not-for-profit organisation in our county dedicated solely to supporting adults and children with all levels of hearing impairment. 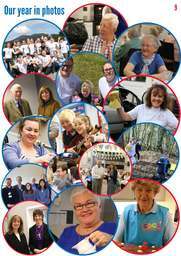 I am delighted to tell you that in recent years the work we do has been recognised both at local and national level, including in 2016 an award for ‘Best Campaign Film’ (Stroud Community TV Awards), and being shortlisted for a national Charity Governance Award. 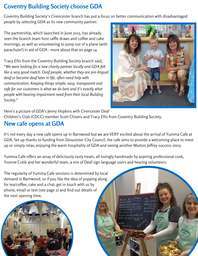 GDA’s work around families where there is a deaf child centres around the CDCC sessions held on the first Saturday of each month, where your child can enjoy a range of craft activities and outings in a truly supportive atmosphere. As a user-led organisation, our experienced and wonderful volunteers understand fully the communication challenges your child may be experiencing at home, at school and just out and about, and we are here to help in a no-pressure way but with our personal knowledge and expertise. 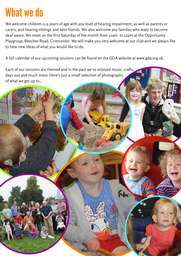 Above all, CDCC is about having fun, but you will see the difference from any ordinary playgroup. To begin with we use a total communication environment of both speaking and sign language, so that you and your child can choose whichever way you want to develop your language with each other, but develop it as successfully as possible. We also are mindful that your child will rely more on visual cues and may have a greater need to feel safe in their personal space, perhaps sitting or standing where others cannot surprise them from behind. You and your child will feel a warmth of spirit at CDCC that I hope gives you a sense of the support that GDA is willing to give you for many years to come, as your child grows and takes on new challenges. We forward to getting to know you and to sharing that journey with you. 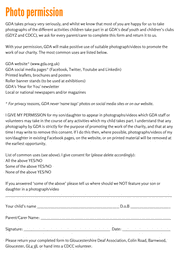 Jenny and Gem GDA is a Registered charity no. 1015937. Company limited by guarantee no. 2692718. www.gda.org.uk Who we are Hi, I&apos;m Jackie Gloyn. I set up CDCC back in 2011 when I noticed that Deaf children in the area needed support locally. Up till 2015 I was a trustee of GDA and now proudly hold the title of GDA Ambassador. I used to run a playgroup many many years ago - I am now a grandmother, and still love children. I have severe hearing loss and in 2012 I had a cochle implant fitted. , I&apos;m Kim Fletcher. 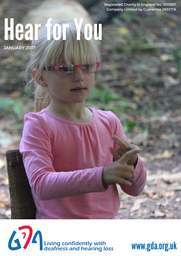 I am profoundly Deaf from birth. From age of three I went to for the Deaf in Exeter and then at six my parents moved to Gloucestershire and I went into mainstream schooling. I did struggle with my education, but at 16 I went back to Exeter for further education and discovered BSL. I am a mum of three and all my children are hearing. I am married to Richard who also Deaf. My youngest comes to CDCC and loves it! Hi, I&apos;m Judy Wood.I am married with two daughters and four grandchildren. I often help with my younger daughter’s nursery in Cirencester. I was invited to join the team of volunteers to help run CDCC four years ago and what a pleasure it has been. To see the children playing and inter-acting with one another is just wonderful and proves how essential this club is. Hi, I&apos;m Nicola Hewlett. I&apos;m married to Mal, we haven’t got any children, but have two dogs and two cats. Scouting has been a big part of my life and working with children brings me great enjoyment - I find their outlook on life inspiring. I&apos;ve been a CDCC volunteer almost since the start and my role is to keep track of the money and the craft stock and to have fun with the children. I have just finished my first training at BSL. 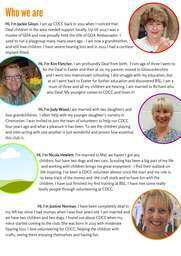 I have met some really lovely people through volunteering at CDCC. Hi, I&apos;m Justine Norman. I have been completely deaf in my left ear since I had mumps when I was four years old. I am married and we have two children and two dogs. I found out about CDCC when my niece started coming to the club. She was born in 2015 with moderate hearing loss. I love volunteering for CDCC, helping the children with crafts, seeing them enjoying themselves and having fun. What we do We welcome children 0-9 years of age with any level of hearing impairment, as well as parents or carers, and hearing siblings and best friends. We also welcome any families who want to become deaf aware. We meet on the first Saturday of the month from 10am to 12pm at the Opportunity Playgroup, Beeches Road, Cirencester. We will make you very welcome at our club and we always like to hear new ideas of what you would like to do. 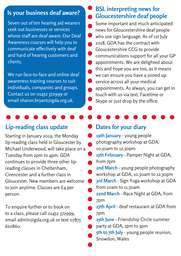 A full calendar of our upcoming sessions can be found on the GDA website at www.gda.org.uk. Each of our sessions are themed and in the past we&apos;ve enjoyed m days out and much more. Here&apos;s just a small selection of photog of what we get up to... CDCC membership form If you would like your child to attend CDCC, please complete the following membership form and return to us at your earliest convenience to Gloucestershire Deaf Association, Colin Road, Barnwood, Gloucester, GL4 3JL or hand in to a CDCC volunteer. 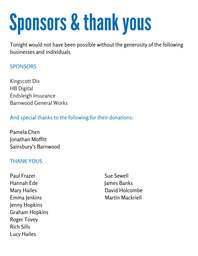 Sponsors & thank yous Tonight would not have been possible without the generosity of the following businesses and individuals SPONSORS Kingscott Dix HB Digital Endsleigh Insurance Barnwood General Works And special thanks to the following for their donations: Pamela Chen Jonathan Moffitt Sainsbury&apos;s Barnwood THANK YOUS Paul Frazer Hannah Ede Mary Hailes Emma Jenkins Jenny Hopkins Graham Hopkins Roger Tovey Rich Sills Lucy Hailes Sue Sewell James Banks David Holcombe Martin Mackriell Programme of events 7pm - doors and bar opens 7.30pm - welcome and &apos;buy a rider&apos; opens 7.45pm - betting for race one opens 7.55pm - race one begins 8.30pm - break for food 8.50pm - raffle draw 9pm - racing recommences 9.30pm - last race auction Rules of play Before racing begins you will be given the chance to boost your chances of winning by becoming a Rider at the cost of £2.50 per horse. 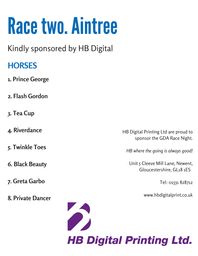 The winning rider of each race will win a bottle of wine! 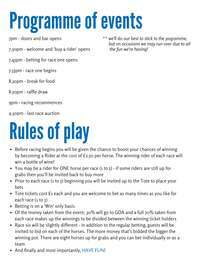 You may be a rider for ONE horse per race (1 to 5) - if some riders are still up for grabs then you&apos;ll be invited back to buy more Prior to each race (1 to 5) beginning you will be invited up to the Tote to place your bets Tote tickets cost £1 each and you are welcome to bet as many times as you like for each race (1 to 5) Betting is on a &apos;Win&apos; only basis Of the money taken from the event; 30% will go to GDA and a full 70% taken from each race makes up the winnings to be divided between the winning ticket holders Race six will be slightly different - in addition to the regular betting, guests will be invited to bid on each of the horses. The more money that&apos;s bidded the bigger the winning pot. 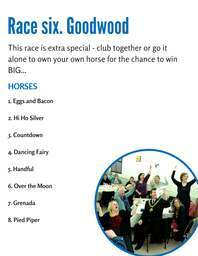 There are eight horses up for grabs and you can bet individually or as a team And finally and most importantly, HAVE FUN! ** we&apos;ll do our best to stick to the pogramme, but on occasions we may run over due to all the fun we&apos;re having! &apos;Dave the Signer&apos; is a hit Last year we launched a series of deaf awareness videos each, of which looked at a different issue that deaf and hard of hearing people face on a daily basis, from accessing buildings with an intercom entry system to the lack of text contact facilities. &apos;Dave the Signer&apos; emphasises the importance of having a fully qualified British Sign Language (BSL) interpreter present at key appointments. The video starred GDA&apos;s Reg Cobb, James Banks and Hannah Ede and to this day continues to be a hit. Since its launch back in January 2015 it has been viewed over 6,500 times!! Along the way it has attracted the attention of Gloucester born-and-bred TV chef Tom Kerridge, as we as the local media and politicians. James is still recognised in public as &apos;Dave&apos;. Needless to say, the response to the video has been fantastic, prompting comments including: "Best deaf awareness video I&apos;ve seen to date" "Good stuff. So sad to think this really does happen though" "This video had me in stitches! But seriously, it&apos;s not funny when it happens to you. Well done Reg and co for producing this fantastic video" Each video features the style of humour and creativity that&apos;s become a trademark of GDA, whilst still portraying a very important and serious point. You can view &apos;Dave the Signer&apos; and other GDA videos on our Youtube channel at www.youtube.com/GDAGlosDeaf. 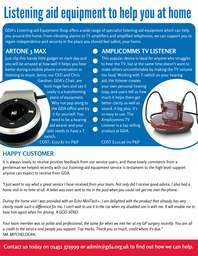 lping you find the right listening aid equipment he right listening aid equipment can really transform your life, and as a not-for-profit organisation GDA guarantees to give you impartial and expert advice. Our highly trained team, Emma Jenkins, Sam Quinson and Sue Sewell specialise in supporting people with all levels of hearing loss, and are happy to ensure you have the time to test different devices until you find what suits you best. 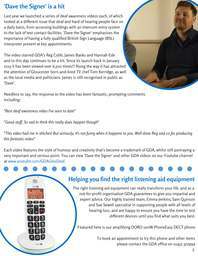 Featured here is our amplifying DORO 100W PhoneEasy DECT phone To book an appointment to try this phone and other items please contact the GDA office on 01452 372999 8 Club updates Gloucester Deaf Club (GDC) meets every Saturday at GDA, where 40 to 50 Deaf BSL users come together to enjoy a range of activities. 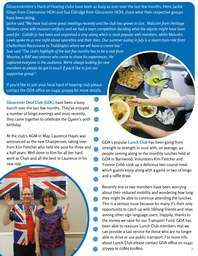 We caught up with Kim Fletcher, Chairperson of the club, about what they’ve been up to over the last few months... "Hi, I&apos;m Kim Fletcher of Gloucester Deaf Club. We have had a busy year during 2015; we have been on a coach trip to the Hippodrome in Bristol to watch ‘Riverdance’, it was so mesmerising. We have also been to the Harry Potter Studios which was amazing and we enjoyed a lovely meal on the way home. The club took a trip to Bath and visited Bath Deaf Club in the evening back in November which was great fun and more recently we went to Café Rene in Gloucester for our members Christmas meal and the foods were so delicious! We play Bingo every fortnight and we’re looking forward to more coach trips next year. I would like to say a big thank you to my fantastic committee who worked so hard to keep our club running and enjoyable." Kim Fletcher, GDC Chairperson GDA&apos;s popular lip-reading classes continue to meet weekly. Here&apos;s the venues and times for 2016: Gloucester at GDA, Barnwood (Michael Underwood) - Monday, 10am-12pm Cirencester at The Waterloo, (Michael Underwood) - Tuesday, 10am-12pm Cheltenham at St Luke&apos;s Church Hall (Tanya Harper) - Tuesday, 12pm-4pm Stroud at St Albans Church Hall (Michael Underwood) - Tuesday, 1.30pm-3.30pm Gloucester at GDA, Barnwood (Tanya Harper) - Tuesdays, 11am-1pm New members welcome to join any time. 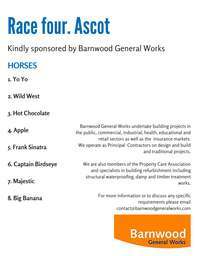 Contact 01452 372999 to book your place. 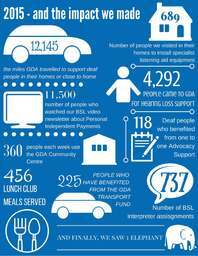 It&apos;s been a busy year for Gloucestershire&apos;s Hard of Hearing clubs. Sue Eldridge, Chair of Gloucester HOH Club shared "We&apos;ve enjoyed some wonderful days out this year; Prinknash really stood out as a great day, and we&apos;ve also welcomed poetry readers and singing groups to our meetings. New members are welcome to join any time, so we look forward to seeing some new faces in 2016" For dates and times when the hard of hearing clubs meet please refer to the GDA website or call 01452 372999. 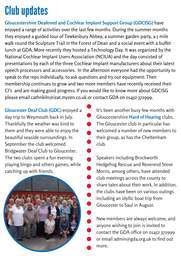 Gloucester Deafened & Cochlear Implant Support Group&apos;s (GDCISG) Cathy Hopkins shares with us what the group has been up to recently. 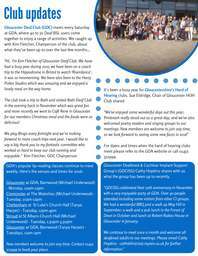 "GDCISG celebrated their 10th anniversary in November with a very enjoyable party at GDA. Over 40 people attended including some visitors from other CI groups. We had a wonderful BBQ and a walk up May Hill in September: a walk and a pub lunch in the Forest of Dean in October and lunch at Robert Raikes House in Gloucester in January. We continue to meet once a month and welcome all deafened adults to our meetings. 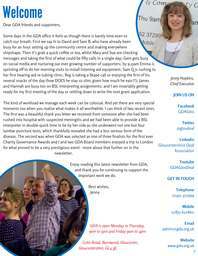 Please email Cathy Hopkins - cathnkiln@izat.myzen.co.uk for further information."